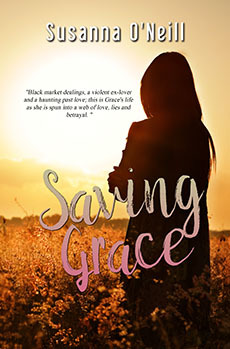 Black market dealings, a violent ex-lover and a haunting past love; this is Grace's life as she is spun into a web of love, lies and betrayal. A novel of trust, friendship, love and betrayal. Grace returns home after years living abroad and the first face she sees throws her emotions into turmoil. How could she have forgotten Charlie, her very first love? The presence of the estranged Eddie, Charlie’s twin brother, painfully reminds her of the tragic past they share but he seems as reluctant to talk about it as Grace does. Her mind is somewhat preoccupied with her new life, however...and her new boss, who leads her on a thrilling journey through the world of art. That is until the violent ex-lover she was trying to escape re-enters her life, bringing with him a dark underworld of treachery and heartache. This envelops everyone she cares for, drawing them into a complex web of mystery, menace and romance. Eddie Hawes. Now that was a name she hadn’t thought of for a long time, a face she hadn’t seen in nearly fifteen years, but there he was, in the very flesh, mere yards away. Grace found her heart was beating particularly fast all of a sudden, whether from the foamy cappuccino she had been sipping or this blast from the past she wasn’t quite sure, but she guessed probably the latter. So, that’s what Charlie would look like now, she thought, studying that striking face, watching those intense eyes and finding she wasn’t especially surprised to discover how handsome he had become. Then, just for a fraction of a second as he turned his head she saw it, the long jagged scar down his right cheek, and a cold shiver ran right through her. He finished rummaging in the boot of his car and made to turn toward her. Instinctively she quickly raised her newspaper to eye level, shielding herself from his gaze and hoping against hope he wouldn’t enter the cafe. He didn’t. A few seconds later she heard the engine roar into life and peeped over the paper to see him drive away. Eddie Hawes. There had been a time when Grace, Eddie, and Charlie had been completely inseparable. They were nicknamed The Three Kings, even though Grace wasn’t exactly a kingly name, but kids don’t care about such details. They’d ruled the school, and she had felt immortal, flanked by the two coolest boys in town...until that summer when everything had gone wrong. Eddie Hawes. It wasn’t that she didn’t want to talk to him again, see what the grown-up Eddie was like; it was just she didn’t want to do it yet. She had only just moved back to town five minutes ago and had spent today going through a tough interview for a job she thought she already had. “So. Tell all.” Alice broke into her shell-shocked senses, as she re-emerged from the toilets and squeezed next to her at the window seat. “What do you mean?” Grace started in bewilderment. Had she seen Eddie too? Grace raised a cheeky eyebrow at her friend. “He’s not a lord,” she said. “Ah, but he is hunky, huh?” Alice grinned nudging Grace in the ribs. Alice screamed in delight causing everyone else in the cafe to glance in their direction, then hugging Grace she extended her congratulations. “Oh, my God, I remember Henry,” Grace interrupted loudly, “he was such a ponce!” She laughed. “Yeah, guess it was awhile...anyway, he took me to the ball...actually I think that’s where I broke up with him...” She pondered, her brow crinkling into a frown. As any local would testify, the mansion was beautiful, set just a few miles out of town, facing east so the views spread right out across the countryside. There was the obligatory gravel driveway, which wound up from the road for about a mile until you turned a bend and suddenly caught your first glimpse of the house. That first view is staggering. The white brickwork sparkles in the sunlight momentarily blinding you, with its glittering eyes watching all visitors approach. There are fifty-three windows on the front of the house alone. The tall towers rise high above you, brushing the clouds as they waft past peeking at this mighty sight themselves. The doorway is a colossal entrance, with a thick oak door and behind it a sweeping hallway leading to a grand staircase enticing you in, like a child into a sweet shop. For Grace, it was like a fairy tale palace, with wings and jewels and even a handsome prince! Grace had done a history degree after her A-Levels and her first job had been as a tour guide in the ancient library where she had spent most of her university years. She had loved the job, taking people around all the areas usually off limits, pointing out different pieces of art, little architectural nuances, interesting nooks and crannies, and explaining the secrets and history of them all. She was a natural and was soon head-hunted by a firm in London who wanted someone to take foreign clients around the sites and give them more than the average tour guide would. She excelled, her research was thorough and inventive, and the crowds loved her fascinating view of the capital and the humour she injected into each tidbit of information. She had a knack, no matter how many times she had told the same story, of making each individual feel as if they were the first and only person she had ever told it to. There was an intimacy about her, even with strangers, which people found comforting and captivating at the same time, making her a very popular guide. Inevitably she was tempted away by one of the said foreign clients who saw that her skills would go a long way in his native Italy. Fortunately, she had always been good at languages and after a crash course and a month travelling around, she was fluent. She worked in Rome, Florence, Turin, and finally Salerno, where she’d met Nico. When the relationship turned sour, she felt suddenly homesick, the first time in all her years abroad. She yearned to be closer to home, to family, to friends, and she could not believe her luck when she saw the Du Luca Old Hall in her hometown was advertising for a tour guide. The money was far from fantastic but she had saved quite a lot while she was away and it was the sort of job she knew she would love to do. Better to be poor and happy than to be rich and miserable. So, she had applied and had even done a telephone interview with the housekeeper, after which she had received a letter saying she had been successful and could start work in a month’s time. However, when she got back to England another letter had been waiting for her, asking for this meeting with Mr. Du Luca. She presumed it would be a fairly routine chat to iron out any queries on both sides, but when she rang to arrange the meeting, the housekeeper implied it was an interview. “But the letter I received stated I had been successful and could start in a month,” she had argued. “Mr. Du Luca is not in the business of employing people he has never met, Miss Nightingale,” was the tart reply. Then why was I sent such a letter? was of course on the tip of her tongue, but she so wanted the job and had resigned from Salerno anyway now that she was loath to appear uncooperative, especially to such a battle-axe. “Of course, I understand. I would also welcome the opportunity to make the acquaintance of my employer,” she had gushed, impressing even herself with her cool. “Would you indeed,” was the surprising response. “Nine o’clock sharp on Friday morning then, Miss Nightingale,” and the conversation was over.